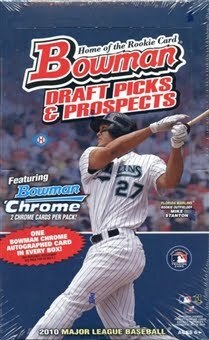 Waxtopia: Bowman Draft Box Break Giveaway! Generating buzz on a new blog can prove difficult, so I think now is as good a time as any to do a box break and give away some free cards! This will be my first video break, so should be fun. I already have the product in hand: 1 hobby box of 2010 Bowman Draft Picks & Prospects Baseball. Let's start by opening up 15 slots, first come first serve. Just comment below and specify your team, once the 15 slots are filled, I'll randomly assign the remaining 15 teams. I will not be participating in the break. Please only one slot per person in order to give more people a chance. Here is a blowout forum with checklist information. All Team USA cards will be randomed off also, so everyone should come away with some decent cards. Welcome to the fold. I'd love a shot at the Cubs. I will take the Tampa Bay Rays! Thanks! I will take the Nats... Thanks! Thanks, I'll take the Tamba Bay Rays! I will take the Pirates, thanks! Well crap, looks like they are taken. I'll take the Orioles instead. Crap, looks like they are taken too! How about the Cardinals. Are the Diamondbacks taken? If not, I'll take them. Dang anyway I can trade my giants pick for the Rangers? If not thats cool thanks! Oh well looks like someone get the Nats before me. Oh well maybe next time then since all of the teams are gone. I'd love a shot at the Twins if possible. Thanks! Looks like the cardinals were taken, how about the dodgers? Can I have the Mets? Looks like we have our 15 teams, I will update the list shortly. Thanks to everyone for participating, if you didn't get in don't worry there will be future giveaways! The 15 slots are filled, I will be using random.org to assign the other 15 teams most likely tonight, and will post the results. I'm thinking either Tuesday or Wednesday night to do the break, hopefully live on ustream. Sounds like this is going to be fun. Thanks again! I would love the Marlins. If not a random spot would be great! I would love a random spot. Thanks! Sweet! Thanks for the break. By the way, this is bballcardkid from FCB. There may be some confusion here, the remaining 15 teams are being randomly assigned among the 15 participants. This is primarily to reduce shipping costs as this is a free break, and also because I didn't expect to have this good of a response! So I apologize for any confusion, but there will be future opportunities for freebies! has the break happened yet?